I just love Christmas :) You send 1 handmade Christmas tree ornament and 1 Christmas card to 6 partisipants. 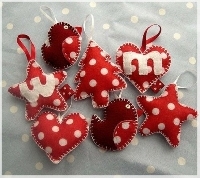 This is a great way to have many different kind of ornamets into your tree or you can use it in some other way. Ornament MUST BE HANDMADE, you can use your imagination. Make them beautiful and like one you would like to recieve. You can check your partners profiles for any likes or clus what they would like. This is senders choice still. Rating must be 4,8 or above. Newbies welcome, but with well filled profiles. No recent 1 or 3 and I ban if I feel like it. I ask the reasons for these first though. Remember to rate you partners, be kind it's Christmas time :) Don't give 1 or 3 unless you really feel like. I mean in case you didn't recieve anything or the swap wasn't what it was supposed to be. Does the card have to be bought? or can it be handmade as well?